Well sort of. It's not very Spring like out there today. I'm keeping my paws indoors where it's warmer & drier today. It's still damp out there from last night's rain. We have had a difficult month this past month. We would like to thank everyone for their support, prayers and positive thoughts. I'm not sure what has been happening in the Shop this past month. It's been a very confusing month & I haven't been in the Shop too much lately. But now I'm back and greeting everyone coming in again. My friend,Princess Leia the Boxer, has been filling in for me as the Shop Greeter while I was gone. She's my buddy who comes in and spends the day playing with me a few times a week. Fabric Challenge Project ladies! Don't forget to get your projects in by Monday, May 2nd. 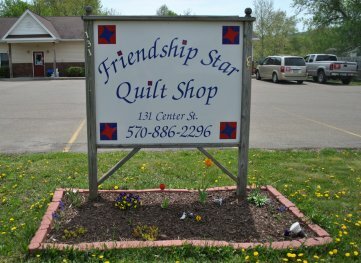 We will hang them here in the Shop but we are also going to take them down to the Quilt Extravaganza. 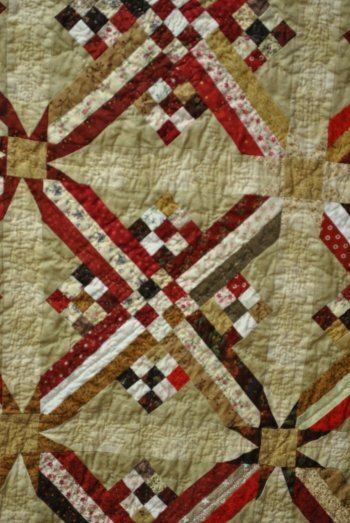 The Quilt Extravaganza is Mother's Day Weekend. Saturday, May 7th 10a-5p & Sunday, May 8th 10a-4p. It is being held at the Old Sale Barn 50 Ballard St., Troy, PA. Admission is $5.00 for 12 and older, $2.00 for 12 and under. Unfortunately, at this time, we don't have much planned at the Shop for May. 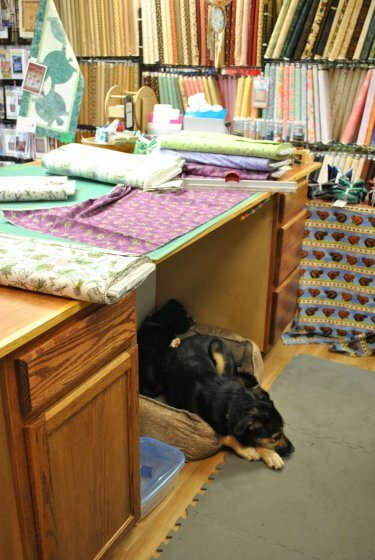 Mom is busy getting ready for the Quilt Extravaganza. We will have a few surprises in store for the all of the folks attending. We do have some classes set up for May and June. I know I said I would get out a separate class list for April. Unfortunately, events out of our control took over our lives last month. I will get out an email with photos of May's classes. In the meantime, here is just the class list. Saturday, May 7th. Sweatshirt Jacket 10a-4p $25.00 plus sweatshirt & material. I will get out a class list with photos for you. The Free Pattern & Demo will probably be a separate email, though. I don't think Grandma has that ready yet. Now onto our Show and Tell for the Month! 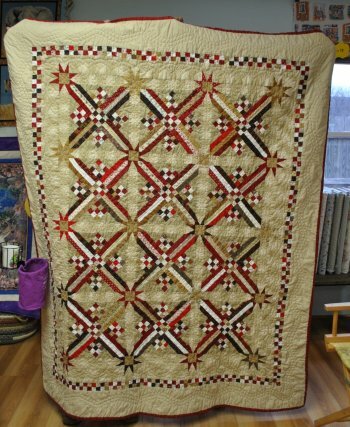 This beautiful quilt was made by Maureen P. of Chemung, NY. I forgot what the name of it is. Sorry. 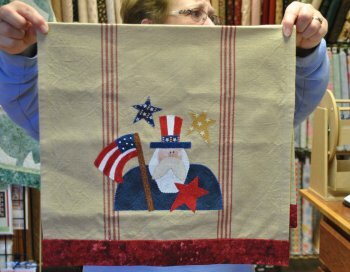 Debbie B. appliqued this onto a tea towel. Isn't it cute? This runner is also made by Debbie B. It's so Springy! We hope to see everyone real soon! I accept dog treats by the way. Mom said not to put that in the newsletter but she's busy with a customer. She won't notice that I put that in. She says I get enough treats from the bank, gas station, feed stores, Arby's and KFC. I don't really agree with that. Do you? Have a great weekend and to all the Dog, Cat & Human Moms "HAPPY MOTHER'S DAY!"